So when I saw Chari's Happy to Design blog was hosting Sunday Favorites, I decided to join in. It is very much like my friend Suzy has..Flashback Fridays..but I guess it doesn't have to be about food..it can be any old post..and I mean that literally! One which not too many saw except for my little band of old friends. We all started blogging around the same time so we encourage each other and learn from one another...So you dear gals, you have seen this, but since it is salad season, and this is really good, I am replaying my very first post.. 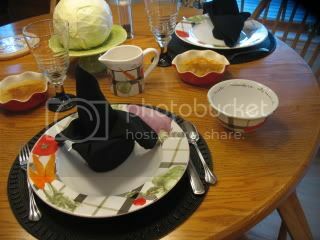 I did cook tonight, nothing fancy..just the 2 of us..
Tonight I used my Market Place dishes from Pfaltzgraff..how about a head of cabbage for a centerpiece..:) well it IS on the plate! It is a perfect way to honor your mother, grandmother, or the woman in your life who helped form you into the person you are today. Share a favorite recipe, plate, etc, or memory in their honor for Mother's Day. Check out the details at her blog..
Have a wonderful Sunday...and thanks for visiting! That vertical pear looks wonder. Thanks for stopping by and saying hello!! Have a great weekend. I loved that pear salad and some day I will try it here. Your dinner looks wonderful - I hadn't heard of that cheese. Hey Kathleen - I did not put "Kathleen" with "Cuisine Kathleen" when you commented on my blog. Duh! Small world this blogging is. I love your site!!! 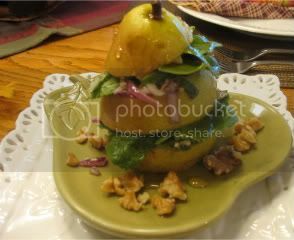 I love the stacked pear salad idea! If this doesn't impress my guests, then they can go home. It looks so good! Thanks Kathleen. Pears are my favorite fruit. Love this recipe and it's so pretty too! I've never seen anything LIKE the vertical pear before. All this food looks good enough to eat!!! Dinner looked very yummy. And the stacked pear salad. I had never seen anything like that. Thanks for sharing. I'm so happy that you decided to participate in "Sunday Favorites"...and thank you so much for the sweet "mention" at the beginning of your post!!! I didn't even realize that there was a similar Friday event...hmmm, but then this old blog world is pretty big with lot's of stuff going on...I learn new things daily! hehe! My friend, this pear salad not only sounds scrumptious but it looks soooo beautiful!!! It's a work of art, truly! That's really a lovely photo of it!!! I have never seen or have eaten anything like this...and I just love pears! I'd love to give it a try! I think that I would like the changes that you made to the recipe much better as well! Thank you so much for sharing the recipe!!! Mmmmm...your dinner sounded lovely too! You have inspired me to try your recipe for the potatoes also! They really sound good and so easy to make! Well my friend...thank you again for joining in with "Sunday Favorites"...I have really enjoyed your re-post and I hope that you've had so fun too!!! The pear salad looks so yummy and the combination of flavors is great! LOVE the presentation! Great post, Kathleen, that salad is perfect for the weather we're finally having! Hope you get some time outside today, it's beautiful! Great post. Love the potatoes! Have to go check Chari's Sunday favorites, I love reruns :) and yours looks great the second time around! I always enjoy seeing your Market Place dishes. Dinner looks really tasty. 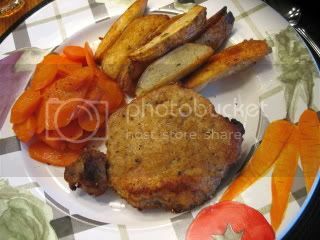 I would clean the entire plate except for the carrots. No cooked carrots for me (even though yours sound delicious)., only raw. I do remember this gorgeous pear sals from the OLDEN days! Loved it then and still am amaezd at the beautiful presentation it makes. Will keep this in my file for this summer! Glad you are looking forward to the Mother Day event..MEME, huh...will have to find out how that same about. I've started one of my Mom's favorite cookie recipe and they are disappearing fast! It came from the Franciscan nuns who operated our hospitals' bakery! That is one beautiful pear salad! I will try that! Great repost for today! My challenge would be keeping the pear upright. I am not optimistic about my skills for that, but I'm willing to give it a try -- the salad looks fantastic! Love those dishes with the veggies on them... how cute are they? 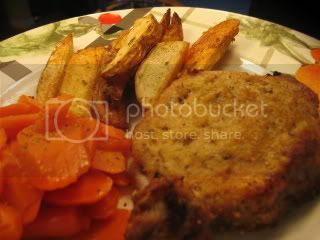 Your dinner looks great; I love simple food cooked well. The best. And yes, the North Fork is calling us -- loudly! Sadly we are so booked with events for the next few weekends that I don't think we'll make it out there till after Memorial Day. The house needs some refurnishing, so my sister and I are going to team up and do a mini-makeover. I'll post about it! Enjoy this glorious weather --what a gift! Go soak in the salt air for me, too! Kathleen, the pear is just a little work of art. Nice to see the second time around. I have the city market platter and I think I got small plates too... I forget, they're still "in the closet". Your pear salad was a masterpiece and I loved seeing it again. With the produce on the city market dishes, I loved the creativity of the cabbage centerpiece. Great looking meal as well. Yum, the pear salad looks so pretty and I know it will taste good too. Thanks for sharing your recipe.